Though this project does take a little advance preparation, I think the result will keep us busy on the back porch for some time. The instructions call for making patterns on glue-covered paper, but I'm sure a blank sidewalk (glue-free) would work as well. I know all my kids--from age 2 to age 10--will figure out their own ways of creating art with their shakers. Step 1: Tint the Salt For each color, put approximately 1 cup of salt and 1/2 teaspoon of liquid watercolor or 20 to 25 drops of food coloring in a ziplock bag. Seal each bag, removing as much air as you can. Outside, let your child shake, smash, and knead the contents until all of the salt is dyed. Next, pour the salt onto newspaper-lined trays to dry for about 2 hours (or just open the bags and let the grains dry overnight). When it's no longer wet to the touch, pour the salt into clean, dry spice shakers, one color per shaker. Step 2: Make a Pattern Offer your child a glue stick and some stiff paper or a paper plate. Encourage her to scribble all over the paper with the glue. 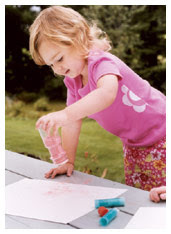 Step 3: Add Color Hand your child the shakers of dyed salt and show her how to sprinkle it onto the paper. Once the glue has dried, simply shake off the excess salt.